This weeks 3CTC is May Flowers, right up my alley! It's no secret.....I *love* using the Paper Tole Technique on the flower from SU's Fifth Avenue Floral, can their be anything prettier? Don't you just want to reach out and touch it! This week I've even used the stem on my card, aren't you surprised! The beautiful paper you see layered on my Baja Breeze base card is Parisian Breeze, it's part of the Scrapbooking Promotion that ends on May 31st. On the panel directly under my rose, I embossed using SU's Texturz Plates and my big shot. The sentiment is from SU's To Have and To Hold, stamped in Chocolate on Baja Breeze, then punched with the Word Window Punch. It's kinda dark to see in the photo, but I did add a Chocolate Flower Brad, placing a small circle of Baja Breeze card stock in the middle. Thanks for stopping by today! Be sure to check out what Kerry and the other Three Clover Challenge members created by clicking the link in my sidebar. This card is gorgeous, Lisa! The rose is so beautiful! Simply Divine. 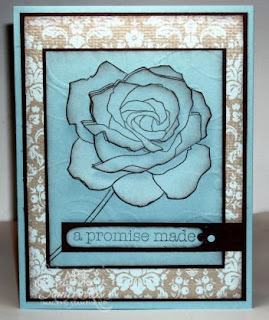 Love the dimension and the embossing behind the image. This is SO PRETTY...The stem makes the whole card!!! LOL! This card is gorgeous. Love the color combo.